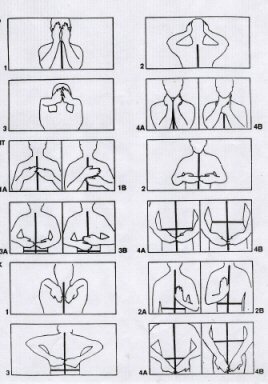 With the simple act of placing the hands on oneself or on another person Reiki energy automatically flows. You would usually start with drawing the Dai Ko Mio, Hon Sha Ze Sho Nen, Sei He Ki and Cho Ku Rei symbols over the client, three times for each symbol. Than you start channelling Reiki energy through your hands to yourself or to the recipient's head, front of the body, back, knees and feet. This enables the energy to flow right to the source of the problem and not just the manifesting symptom. Reiki energy goes to where ever the recipient needs it most. Remember not to force where the energy is going, just let it flow through you to your client. During a typical session place your hands on the different locations of the body for 3-5 minutes each, or hold until you feel you should move your hands away ( use your intuition). Cup hands slightly, fingers holding together, the lighter the touch the better. You or your client should be lying down comfortably on a treatment table or sitting on a chair if they so wish. William Lee Rand demonstrates hand positions for a Reiki self-treatment. Standing on the clients right side help them to flip over onto their stomach. Learn more about the Reiki hand positions.William Lee Rand demonstrates hand positions for treating others.